Today the Wayback Machine is taking us allll the way back to March of 19xx, a week after my 5th birthday, when I got my first haircut. Five years. My mom kept my bangs trimmed, but in five years of life, I'd never had an official haircut. I complained about my hair a lot, so the story goes. I hated having my hair washed, brushed, everything. I was sick of the tangles and my mother was sick of the whining. So she took me to the local salon in town, McLean's, and a woman named Wanda chopped off my ponytail. My mom kept the ponytail in her cedar chest until we bought our house and she dropped all my childhood vestiges on my doorstep. I keep it in a box in my bookshelf, along with an Eisenhower silver dollar from my Big Papa, a pin from my First Communion, and a handkerchief that belonged to my Little Grammy. Why am I thinking about my first haircut today? Because right now, my hair is really LONG. 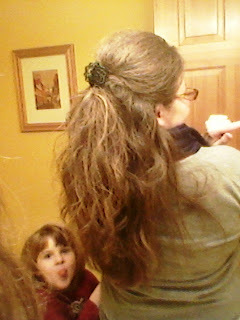 And tomorrow, my dear friend and stylist Sara is going to chop off my ponytail so I can send it to Locks of Love. I'm really excited. I didn't originally intend to grow my hair out for this purpose, but I realized over Christmas that it was long enough to donate 10 inches and still have enough left over to not have that super-short bowl cut I sported during my elementary school years. I took this photo one morning to send to Sara so she could get an idea of how long my hair is - the best part is little Birdy sticking her tongue out at me. Check back tomorrow for before and after pictures. That is such a nice thing to do. One summer my daughter and my niece all donated our hair to locks of love. I donated my hair a year and a half ago. It such a good feeling to do that. Kudos to you. That's awesome that you're doing that, Sara! When I chopped my hair off some months back, I was hoping to donate it, but it had too many layers in it. :( Maybe another time. What a wonderful thing to do! I'm so impressed. 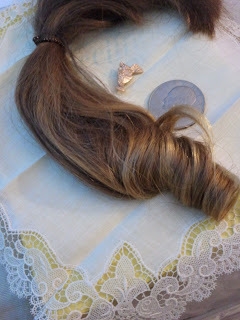 My hair is ridiculously long (I'm just too lazy to cut it), and I'd have tons to donate if Egypt had this kind of thing.